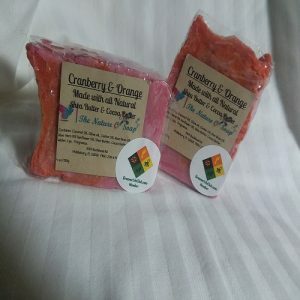 Short Product Description: These shower cakes are designed to release menthol, peppermint, and eucalyptus vapors while you take a shower – perfect for cold and sinus relief. 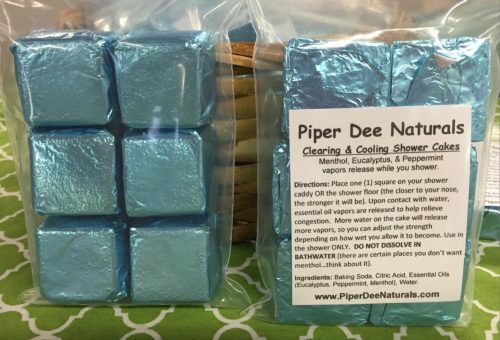 Cold and flu season is here, but our Piper Dee Naturals Cooling and Clearing Decongestant Shower Cakes are a perfect remedy for those stuffy noses and clogged sinuses. Simply place one little square on the floor in a back corner of your shower, where it will get a little water, but not be soaked. You can also try it in your shower caddy. When water hits the cake, it will begin to fizz and emit soothing vapors of menthol, eucalyptus and peppermint to relieve your congestion. You only need to use one little square per shower to feel congestion relief. The cake will completely dissolve in the shower when it is finished. You can control the strength of the vapors by increasing or decreasing the amount of water that hits the shower cake. If you put it in a shower caddy directly under your shower head, you can flick water on it throughout your shower for a nice burst of clearing vapors. This listing is for one package of six (6) Clearing and Cooling Shower Cakes. 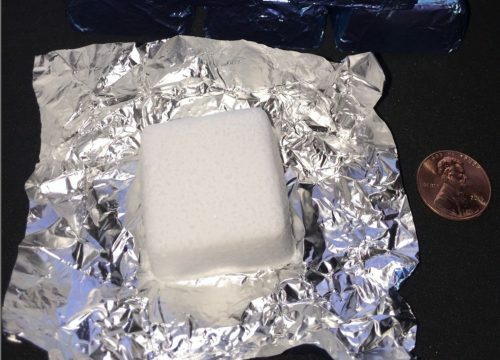 Each cake is individually wrapped in foil to preserve the essential oils for a longer shelf-life (~6 months). Ingredients: baking soda, all-natural citric acid, menthol crystals, eucalyptus essential oil, peppermint supreme essential oil, water.